Paired Comparison Method in actual is to know the scale values of statements by revaluating them on psychological continuum. That’s why this is included in under the re-measuring sentence methods of attitude measurement. Paired comparisons methods are based upon the law of comparative judgment given by Thurston. In the decade of 1920, Thurston published many articles about attitude measuring scales. The law of comparative judgments provides a base to arrange the stimuli on psychological continuum. The law of comparative judgment helps to measure subjective experiences and any given Stimuli characteristics which may be different from everyone but in indefinite quantity. The main problem in psychological rescaling is if Stimuli can be arranged on the basis of their related qualities on psychological continuum. Here one thing is clear that a psychological continuum for some stimuli cannot be used for other stimuli. By these methods only different stimuli of a set of Stimuli given can be arranged on psychological continuum on the basis of their different qualities. According to the law of Comparative judgment, a modal discriminal process is possible on the Psychological Continuum of given any Stimuli. The discriminal process means the response or decision given by a person regarding some quality on some Stimuli,, because different people react differently on some particular Stimuli. Therefore it is important to make some assumption about these discriminal processes. Thurston has said that the distribution of discriminal reactions given by many people on stimuli can be considered as Normal Probability Curve. The medians and deviation of norms given by different persons on Stimuli or a sentence can be subsequently described as Scale Value and Discriminal Dispersion. It is clear that the values of different Stimuli’s or statements will be different in scale value and discriminal dispersion. For example, we that there are two statements related to some psychological thing, i.e., i and j. A big group of people was asked to compare, which one is more favorable: i or j. Members of the group were not permitted to describe them equally favorable. If half of the group (p = .50) says i is more favorable than j and rest half says (Q = .50) j is more favorable, then we can say that i and j both represents that quality equally which was being measured because according to Model Discriminal Process the value of both are same. Note: The first column and row of the table are presented the values of p, while the body relative to the z values are given on p.
On the contrary, if more than half members of the group say that (p > .50) statement i is more favorable than statement j, then it can be said that the modal dicriminal process of i is greater than j. On the Psychological Continuum from minimum to maximum, in the same way if more than half people say that (p < .50) sentence i is less favorable than j, then it can be said Model Discriminal Process of i is less than j. So it is clear that the state of Model Discriminal Process of statements i and statement j on the Psychological Continuum is based on the ratio of comparative results. So it clear that frequency of people telling that statement i is more favorable than j, can be judged after receiving the comparative results from the group of people. If f, is the frequency of the (number) the people telling i is more favorable than j, then the ratio can be obtained by dividing it with the total number of persons, N.
It is clear from the given equation that the Medians of Z given in the columns of Z Matrix express the deviation taken from the medians for the scale values of statements. Clearly the total of all scale values will be equal to zero which can be used as a check for the precision in calculation. The statements of having negative values will be less favorable from normal statements and the statements having positive values will be more favorable than normal statements. As the center point of Scale Value which is taken as a Median for every statement on the psychological continuum, is arbitrary, therefore any constant can be added in it to make the scale values positive. Addition of the constant does not make any change in the scale value of different statements. Normally for the convenience all the Scale Values are converted in positive values by adding a constant equal to a maximum number of negative values. By doing this, the statement having a maximum negative value, changes to Zero and all the other scale values are converted in positive values. While deriving the scale value of statements, sometimes, all people like only one statement from the two statements of a pair. Then the value of ratio P is denoted approximately one or zero, and as a result, we get the highest value of Z (positive or negative). In this situation the use of Z value is not appropriate for deriving the median Z, because the very high positive and negative values of Z, increase or decrease the values of median Z unnecessarily. Therefore the value(s) of Z in Z matrix are higher than ± 2.00, then it is reasonable to calculate median Z by considering them equal to + 2.00 or −2.00. After knowing the scale value of different statements, Attitude Scale is prepared by keeping all the statements in a random order. The scale prepared in this way is presented before the people whose attitude is to be scaled. They are asked to tell that from which of those statements they agree and from which they disagree. It is clear that their responses will reflect the Attitude of the person about those things, for which the statements are prepared, and scale values are derived. It is expected from the person having more positive attitude, that he will be agree with the statement having more scale value, while from the person heaving less Attitude, it is expected, that he will agree with the statement, having less scale value. Therefore to get the Attitude score of a person can be known on the basis of scale values of agreed statements. A median is normally used for this purpose. In other words, if a person agrees with three statements with scale values 2.5, 2.8 and 3.1, then his attitude score will be the median of the three, which comes as 2.8. In the same way if a person shows his acceptance about four statements like .78, .95, .97 and 1.02, then his attitude score will be the median of these four, say .96. 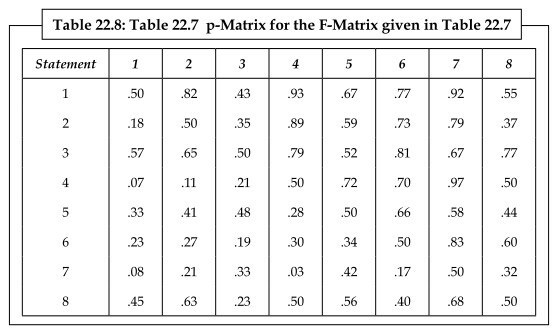 For the convenience of the readers, an example is presented here for preparing F Matrix, P Matrix and Z Matrix. For example Let us assume that, total eight statements are prepared for attitude scale and their scale value is to be known by arranging them on psychological continuum through method of paired comparisons. It is clear that total 28 couple or 28 pairs will be prepared. For example, we assumed that these pair of statements are given to 150 person (N = 150) and they were asked to choose the statement from each pair, which they like most. 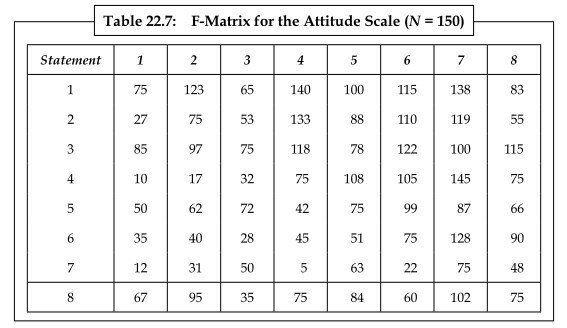 It was found that the total of two attitudes, received from any pair will always be equal to N (means 150) these frequencies can be written in the form of F-Matrix according to Table-22.7. The figures in Table 22.7 show that out of 150 people how many like column statements more than the row statements. N/2 or 75 is placed at the hypotenuse; the ratio of frequencies can be obtained by dividing every frequency by N or 150 which are presented in table 22.8. Prepare attitude statements and compose them. Arrange attitude statements in pairs, if the total number of statement are n, then n (n− 1/2) will be the pair. Present pairs of attitude statement to a group of people, and know that which statement of the pair is more favorable to him, as compared to the other. Prepare F matrix with the help of reactions given by the people on the pairs of statements. Get the value of p, by dividing all the f values of F matrix by n, and prepare the p matrix. 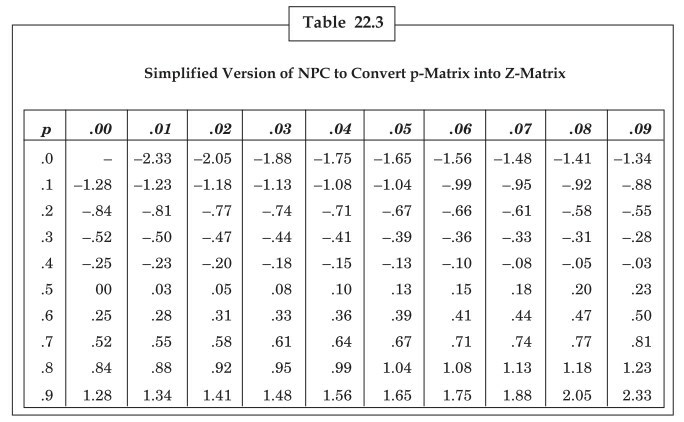 Convert p matrix in Z matrix with the help of normal curve table. 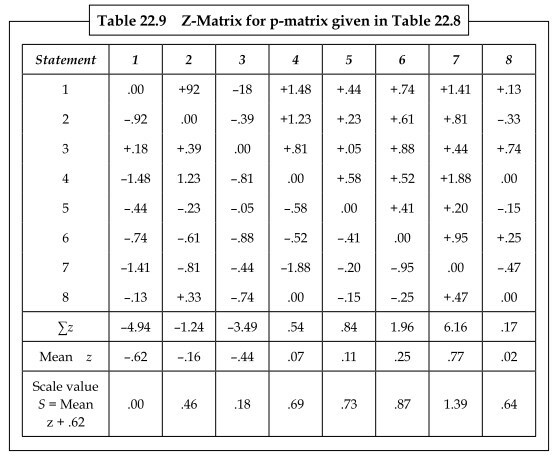 Get the median of Z values given in the columns of Z matrix, While obtaining the median if the value of z is more than ±2, then it should be considered as ±2.00. After obtaining the scale value, prepare an attitude scale by arranging the statements in a random order. Apply the attitude scales on those people, whose attitude is to be scaled and to obtain their agreements and disagreements on different statements. Know the median of scale values of all the agreed statements, which will be an attitude score for that person. To know the reliability, legality and norms.